The home featured exposed structural steel members to capture the expressive material aspects of the project. A reversed ‘C’ section steel beam was used to conceal the flat roof of the upper storey whilst an ‘I’ section steel column was used to support the overhanging porch. This industrialised twist was continued throughout the front facade with perforated sheeting features within the front fence and upper storey cladding. The use of cedar lined soffits provide the home with its warmth, this maintains balance between the greys and neutral tones of the contrasting rendered elements. The custom glazed panels help to animate this building giving it its charming glow. These clients were both bold and brave, and granted us the opportunity to explore and demonstrate our creative abilities during the early stages of our business. 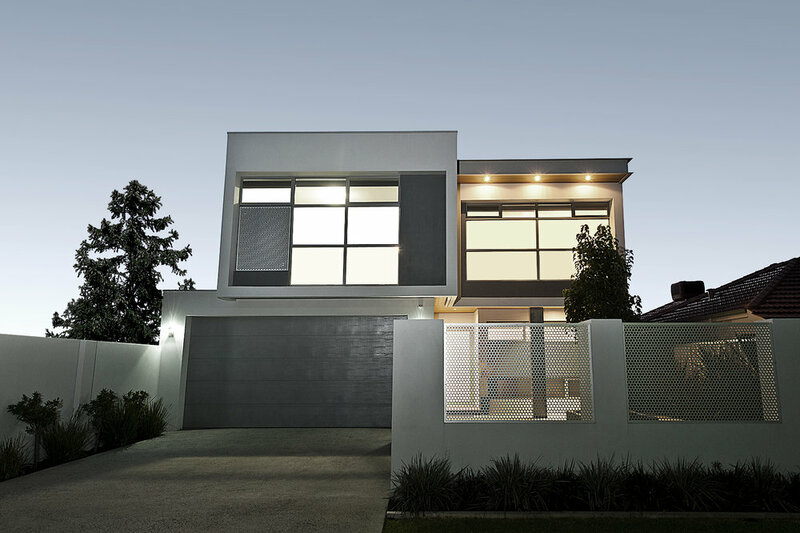 Despite the fact that this home was designed in 2009, it still reflects a smart, modern and timeless style. The clients recently reconnected with us with an opportunity for continued business. They revealed that a change in their circumstances prompted the sale of this home in 2014. Notably, the home sold well above its recommended market price.